Most modern cameras used underwater offer image stabilization. Image stabilization is designed to allow you take sharp photographs at slow shutter speeds without the blurring effect that would otherwise be caused by slight movements of your hands during exposure. It is also used to smooth out video footage when filming hand held or from a moving vehicle. It enables a stills photographer to resort to using shutter speeds that would otherwise be impractically slow when they have reached the limits of their cameras ISO range or lenses maximum F stop. For instance it might not be possible to use an ISO as high as is needed in the prevailing light conditions because of unacceptable noise levels or the F stop of the lens might already be at its maximum opening. Image stabilization gives you the option to reduce your shutter speed to compensate and choose lower ISO’s or smaller F stops with much less risk of motion blur when photographing a static subject. It cannot prevent motion blur if your subject is moving. Before the introduction of image stabilization an effective rule of thumb was to use a shutter speed that matched the focal length of your lens if you wanted to avoid camera shake from hand holding. For underwater photographers who don’t use full frame cameras, it’s still good practice to equate this to your lenses 35mm equivalent focal length. So, if you use a 60mm lens, the slowest shutter speed you should use is 1/60th. If you use a 105mm, 1/125th would be in the ball park. The shutter speed does not have to match the focal length exactly, but it should be close and it is safer to err on the faster side, rather than use slower speeds if you can’t get a perfect match. For wide-angle lenses, quite slow speeds can be used – 1/30th for, say, a 28mm, perhaps 1.15th for a fisheye. The ‘safe’ shutter speed is directly linked to the degree of magnification your lens provides. A telephoto lens, like a 105mm, magnifies the image, but also accentuates motion blur from hand holding. A wide-angle is a reducing lens and shake is much less obvious at slower speeds. If you shoot super macro – for example you use a macro lens equipped with a teleconverter or INON UCL close up lens to further increase the magnification (as Lisa often does) - high shutter speeds may be needed to prevent camera shake. A lot depends on whether you are using a strobe or a video light. INON strobes expose the image at a very high speed, much faster than the shutter does, in fact. If all the illumination comes from your INON strobe, because your subject is in the dark or you have selected an exposure combination that excludes all ambient light, shutter speed is much less of a concern. The light from your INON strobe will be so brief it will freeze any motion from your hands or your subject. If, however, some ambient light is included, such as taking a balanced light image of a nudibranch, then the ambient light could cause motion blur and high shutter speeds need to be used to avoid this, even though the subject itself isn’t moving. Motion from your hands is the problem. If you use video lights, then motion blur from your hands quickly becomes a much greater concern. This is because it is a constant or ambient light source, like sunlight. 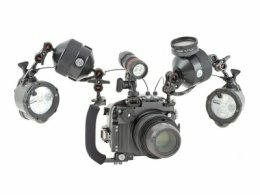 Video lights have been vastly oversold to stills photographers in our opinion. If you are shooting close up, macro or super macro stills pictures you will normally want to use a small F stop to maximize depth of field. With an SLR this might be F64 in real terms. If you then want a safe shutter speed to decrease the risk of motion blur of 1/250th or higher (remember the more you magnify your subject, the more you increase the likelihood of camera shake) you may find you have to use very high ISO’s to achieve correct exposure with a video light. This may lead to unacceptable levels of noise. Strobes are much more powerful than video lights and it is usual for INON strobe users to select the lowest ISO ranges for close up, macro and super macro photography. For nearly all stills photography a strobe is a much better solution for properly lighting your images than any compact video light. INON make this very clear in their product information. We do use INON LE and LF video lights, but more for focus assist than for actually lighting stills pictures. This is one of the few times image stabilization might have helped. Taken at night with an Olympus XZ-2 fitted with an INON UCL100 close up lens, a 1000 lumen video light was used for illumination. An F stop of F7 was chosen to maximize depth of field. An ISO of 500 was selected by the camera. The resulting shutter speed was 1/80th. Image stabilization would have simulated shooting at a shutter speed of around 1/320th. A high shutter speed is needed because of the increased magnification of any camera movement by the close up lens. A negatively buoyant camera also exacerbated instability. A strobe would have allowed an ISO of 100 or less to have been used for minimum noise and maximum detail and would have frozen all movement. Video lights are regularly oversold for stills photography. Image stabilizers can be problematic for underwater photographers because they can cause vignetting. Vignetting is when a corner or corners of your picture is darker than the main area or has shadow in it or something physically blocking it. If you are hyper-critical, you can sometimes see a slight fall off in light at the very edges of wide-angle pictures because as lenses get wider it becomes much harder for lens designers to prevent some vignetting. Shadows can also be introduced from a mismatched lens hood or camera housing port. More obvious are physical obstructions. A classic example is when cameras, housings and interchangeable or conversion lenses are mismatched. The camera may well photograph the inside of the port or conversion lens itself! Purchasing equipment from an official INON UK dealer should avoid this type of problem as they are fully product trained and understand matching lenses to cameras properly is anything but straightforward. You also have our personal back up, which is clearly not the case with the grey importers in the UK who do not have INON Japan’s support either. You can confirm that we stand behind your INON purchases by checking our list of authorised INON UK dealers. Image stabilizers can introduce vignetting because of how they work. To minimize blur from hand movements of the camera, the image stabilizer moves either the camera sensor or some of the elements within the lens to compensate. If you think of an egg and spoon race with the egg as your subject and your body as the image stabilizer you get the drift. Your body is moving constantly to keep the egg in position. The image stabilizer is doing the same thing to keep the subject centered. Like your body, though, the stabilizer is shifting the sensor or lenses all over the place to do this. And this is the problem if you are using housings and/or conversion lenses. As the image stabilizer moves the sensor or lenses ‘off centre’, it can photograph part of your conversion lens or lens hood or housing port. This will normally appear as a small blacked out area in one corner only of your photograph. As a rule, image stabilizers have little use for underwater stills photographers. This is because we normally use quite fast shutter speeds to freeze motion blur from our subjects and these are also fast enough to eliminate blur caused by hand holding. We teach proper use of shutter speeds during the INON UK Level One Underwater Photography Course. So our advice, in most situations, is to turn off the image stabiliser. A Canon EOS6D professional full- rame camera in its INON X2 underwater housing. This is the system Lisa chooses. The high magnification of the Canon 100mm macro lens combined with an INON UCL close up lens allows breathtaking details of tiny subjects to be photographed. But it also magnifies camera shake from hand holding. The design of the right hand wrist support and shutter release lever minimize this and INON float arms bring the system back to neutral buoyancy. Although a video light is used for spotting and focus assist, strobes are used for taking pictures. Strobes are much more powerful than video lights enabling high shutter speeds to be used to eliminate motion blur, small F stops chosen to maximize depth of field and low ISO’s selected to decrease noise and improve detail. Image stabilization offers no advantage in this situation. The main exception is low light photography of static subjects. This might be wreck or cavern photography or reefscapes during magic hour. In these situations your image stabilizer can be a useful tool. These subjects lend themselves to wide-angle photography. In this case, you may want to zoom in slightly if you are using an INON UWL or UFL wide-angle conversion lens or shoot slightly wide so you can crop your image later to exclude any intrusion from the image stabilizer. The image stabilizer can only do so much, so, if you can, brace yourself to keep the camera as steady as possible as you take the picture. If you know you will be working in low light, for example you specifically want to shoot inside a shipwreck, then it may be better to use a tripod. Tripods can easily be made up from INON strobe arms, so you can enjoy this realm of low light underwater photography without having to pack additional equipment and without the hassle of trying to prevent a tripod designed for air corroding from exposure to seawater. Tripods allow shutter speeds as slow as you like to be chosen, enabling creative painting with light techniques to be tried, not just traditional low light photography. Painting with light is discussed in the INON UK Level Two Underwater Photography Lighting Course. A tip when using tripods is to use the self-timer to set off the exposure. Operating the shutter release inevitably jars the camera slightly and you might get motion blur, especially if there are bright areas in the shot, such as light filtering through hatches into an otherwise dimly lit engine room. Using your self-timer gives the camera time to settle solidly into position before the shutter opens. A half second exposure was needed for this available light image. Using a tripod eliminated blur from hand movements. An F stop of F1.8 was used with an ISO of 250. Using image stabilization, this would have been just about possible to pull off hand held. A shutter speed of 1/30th would probably be needed. The ISO would have needed to be increased to a noisy 4000 or so without use of an image stabilizer. Using image stabilization, this could have been reduced to about 1000. Image stabilization can be useful in these shooting situations, but think about shooting slightly wide to make it easy to remove any vignetting it causes in post. The comparison image was taken hand held at a shutter speed of 4/5ths of a second, beyond the correctional abilities of image stabilization. Olympus XZ-2 with INON UWL-H100 Wide Conversion Lens. When shooting video with wide-angle lenses, Steve turns off his image stabilizer. The key to smooth video underwater lies in precision buoyancy control for both the diver and the camera. Steve always ensures his video camera is both neutrally buoyant and neutrally trimmed. For single cylinder diving we both use Zeagle back inflation BCD’s which we have found to be very stable for stills photography and video work, as well as very comfortable and rugged. It’s important to be properly weighted so you can avoid overinflating your BCD or drysuit as the air can shift dramatically, destabilizing you and increasing the risk of blurry pictures and making it hard to accurately frame your image or footage. INON float arms make it easy to properly balance your underwater camera outfit. Understanding the uses and limits of your cameras image stabilizer will help you make better underwater photographs and shoot great video sequences. We hope this INON UK underwater photography article has been useful. Stabilizing your underwater camera and having personal precision buoyancy control skills helps you prevent motion blur and lets you accurately compose your images. Mark Koekemoer from The Underwater Camera Company uses INON float arms to keep his camera neutrally buoyant and properly trimmed.